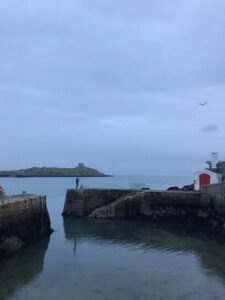 / Things To Do in Dalkey! Dalkey or Deilginis (Irish for Thorn Island) is one of the seaside towns on the south of Dublin. Dalkey has an ancient, rich and varied history. It was founded as a Viking settlement and became an active port during the Middle Ages. According to chronicler John Clyn (c.1286–c.1349), it was one of the ports through which the plague entered Ireland in the mid-14th century. It has been home to writers and celebrities including Jane Emily Herbert, Maeve Binchy, Hugh Leonard, Bono, Van Morrison and Enya. 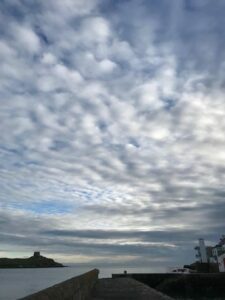 There are some things you can do in Dalkey. If you ask me, the first place you should visit is Biddy’s Cottage. It was a great experience for me. There, you can feel the Irish warm and welcoming nature. Biddy’s Cottage will make you feel at home and will tell you some great stories while you are having a cup of delicious tea. I don’t think your trip will be complete without a trip to Biddy’s Cottage. As I mentioned before, Dalkey history is rich. You can feel it from the first steps you take on the streets. Although there are not many places to go, and it is not a big area to visit, take a look at the buildings design and charming small stores. It looks like a small village, but it is a gorgeous area with all its silence. Dalkey main street, Castle Street, has a 10th Century church and two 14th Century Norman castles, one of which, the Goat’s Castle, houses the local Heritage Centre (the other, Archbold’s Castle, is a private property). Dalkey Castle & Heritage Centre has an early Christian church and graveyard, as well as an another, more modern Heritage Centre and the Writer’s Gallery. Writers’ Gallery includes everyone, from Beckett to Binchy to Bono. You should definitely visit it. Also there are some Guided Historical Walks and Guided Literary Walks in Dalkey. You can go to Dalkey Island. Boats are available on the seashore, it is a five-minute boat ride that will take you to the Island with its Martello Tower and atmospheric church ruins. Wandering rabbits and goats will keep you company on the Island!